TS Training Programmes 2017, Telangana Teacher Trainings, TS Directorate of School Education conduct Training Programmes for Teachers to improve teaching skills, Training to TS D.Ed, B.Ed Teacher Trainees to improve teaching skills, This Training programme empowers the teacher trainees in art culture and value education and improve their teaching skills, sense of responsibility in the process of Nation Building. Training programme 2017 in partnership with Lead India 2020 Foundation. 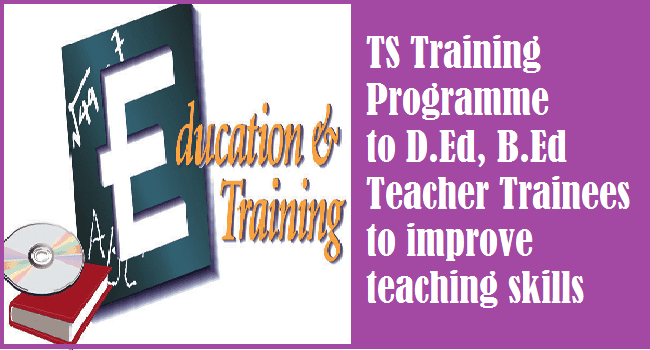 Subject: Directorate of School Education - Imparting values skills and goals through Lead India - Training to the Teacher trainees of Diploma in Education (D.Edl.Ed) and B.Ed., of Government and Private Teacher Training Institution and B.Ed., Colleges - Orders issued. Ref: Letter from Prof. M.B. Sudharshana Acharya, Lead India 2020 Foundation, Dt. 23-06-2017. All the DEOs in the State and all the Principals of Government DIETs, CTEs and Private Teacher Training Institutes and Colleges for Teacher Education are hereby informed vide reference cited it is proposed to train the trainees undergoing Diploma in Education (D.Edl.Ed) and B.Ed., of Government and Private Teacher Training Institution and B.Ed., Colleges by the lead India 2020 Foundation in the Institutes,. The Lead India volunteers / organisers shall visit the colleges and select interested trainees for training of trainers who intern train the students of nearby schools. This programme empowers the teacher trainees in art culture and value education and improve their teaching skills, sense of responsibility in the process of Nation Building. The Lead India 2020 Foundation will issue a certificate for social credits. Training Institutes in the State are informed to take up the programme in partnership with Lead India 2020 Foundation.